​As college students settle back into their ivy-covered campuses across Pennsylvania for the fall semester, former DEP intern Brittany Sprout has begun pursuit of a new dream inspired by her transformative experience working for the agency. 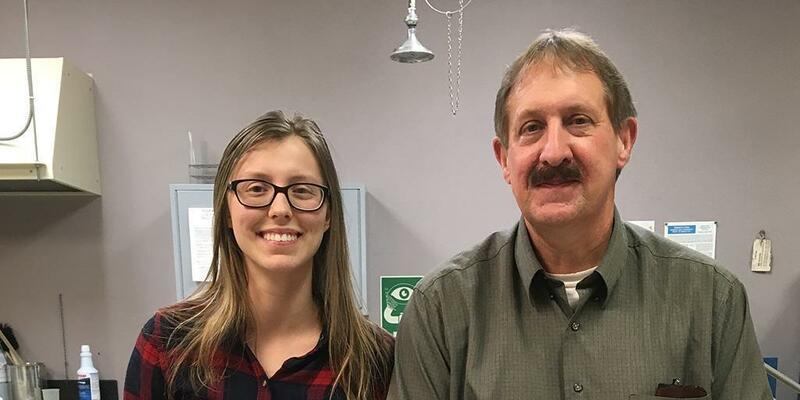 As a rising senior biology major at Lock Haven University, Sprout had no aquatic coursework or prior related experience when she began her summer internship in DEP’s North-central Regional Office (NCRO) in Williamsport in May 2017. But once she began processing and subsampling macroinvertebrate samples in the NCRO lab, Sprout developed an interest, enthusiasm, and skill set that led her to enroll in graduate school with plans to pursue a career in aquatic biology. ​During her paid DEP internship, Sprout participated in a wide range of hands-on tasks in the field and in the lab, including stream and lake surveys, habitat assessments, electrofishing surveys, processing fish tissue samples, taxonomically identifying macroinvertebrate samples, and calculating biological metrics and Index of Biotic Integrity (IBI) scores—all essential steps in the highly technical process required for DEP to perform its duties to assess and protect the region’s waterways. Her work was supervised by two aquatic biologists in NCRO’s Clean Water Program: Dave Rebuck and Steve Means. Sprout became a voracious learner, rapidly achieving proficiency in the processing and taxonomic identification of aquatic macroinvertebrate samples. She developed a skill level that Rebuck says is “rarely achieved” by student interns. She used a stereomicroscope to take high-quality digital photos and assembled them into a library of reference images for use by the NCRO staff. By the end of the summer, Sprout helped the staff to process the entire inventory of macroinvertebrate samples in NCRO’s laboratory. After completing her summer internship, Sprout returned to work for additional time during the following winter break, when she helped train new interns to continue her work. Her life-changing DEP internship experience led Sprout to work as the lead macroinvertebrate taxonomist on a joint research project between Lock Haven University and the Pennsylvania Fish and Boat Commission during her final undergraduate semester in Spring 2018. Recently, Sprout took the biggest step toward her new dream of becoming an aquatic biologist by beginning study at the University of Denver in a Master of Science program in Ecology and Evolution. Her graduate research will focus on collecting aquatic insects throughout the Rocky Mountains to study the impacts of high altitude environments on benthic macroinvertebrates. Beyond her exemplary service to DEP, Brittany Sprout will also be remembered for a lasting personal gesture: Painting a canvas portrait of a mayfly for the NCRO lab. Visit the DEP website to learn more about the DEP Internship Program and find out how talented students can apply​.